Will EV Charging Stations Be Free? With luck and the right circumstances, car charging could become like cable TV or cell phones, says Ecotality CEO Jonathan Read. It’s a magic concept to Americans, even more powerful than “Senior Citizens, 10 Percent Off!” -- and it’s one that car charging advocate Ecotality wants to use to its advantage. The company is in the midst of concocting subscription and payment plans for its car charging network that will begin to take shape next year, said CEO Jonathan Read in a recent interview with us. And one of those subscription plans could involve giving away home charging stations -- usually a $1,200 purchase with a $500 to $600 installation fee -- with extended-year contracts. Other ideas: reducing the basic subscription fee to a low $5 or $10 a month to transform a subscription from a questionable necessity to a no-brainer purchase, or premier packages that will let customers get discounts on high-speed charging and other services. The next few years will determine who wins and loses in car charging, according to Read. It could also determine which vision for car charging becomes reality. Startups like Coulomb Technologies and Better Place are banking on hopes that car charging becomes a consumer service, while established giants like General Electric, Schneider Electric and Siemens generally see this as more of an equipment opportunity. Whatever the business model, everyone is lining up alliances with car manufacturers, electricians, retailers and others to create sales channels and colonize real estate. By late summer 2011, Ecotality hopes to have 15,000 of its Blink charging stations planted and operating in seven metropolitan regions in the U.S. Partners include SDG&E and Best Buy. Car dealers will be part of the mix, too: although car makers are selecting preferred charging companies, dealers can offer charging stations and installation services from anyone they want. Ecotality hopes to generate revenue from four sources: hardware and equipment sales, monthly subscription fees from consumers and fleet owners, advertising at the charging stations, and grid services to utilities. The hardware revenue is fairly straightforward. 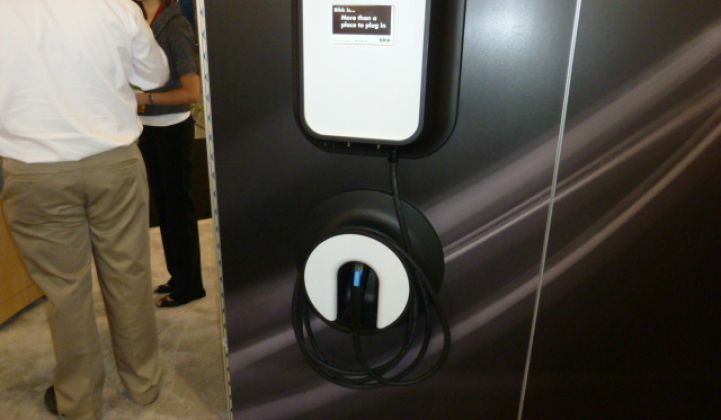 A standard 110-volt station costs $1,200, while a 220 charger costs $2,500. (Fast DC chargers will likely cost more.) The cost will be paid up front or might get baked into a service contract. Installation adds additional costs, which will be overseen by third parties. The cost varies by geography: Arizona will likely be cheaper than San Francisco because homes are newer, already have robust residential wiring (thanks to the need for air conditioning), and life costs less. Subscription fees at the most basic level act as an insurance policy. For $5 to $10 a month, Ecotality subscribers will be able to reserve time at public chargers, get text messages about the state of the charge in their car, and get maps and directions to chargers. A social network for Ecotality customers will let them trade tips and advice on EVs. Subscriptions do not include home electricity and won't likely include power at public chargers at the most basic levels. Advertising? No, no one will sit for eight hours by their chargers to watch video ads like you watch ads now at a five-minute stop for gas. But a charging station at a mall could send text messages to you with coupons from merchants. “They know who you are when you're plugging in,” he said. The demographic rating for EV owners will likely be AAA, he added, so advertisers will pay to get on the network. Utility services will mostly revolve around ensuring that home charging occurs at night. Ecotality will receive fees for managing and timing home charging. Programs -- such as giving consumers large discounts (3 cents per kilowatt hour) if they comply with managed charging programs -- might get funneled through car charging service networks. Will it work? It’s hard to say at this point. Most consumers will charge at home, where they will buy electricity straight from their utility. Jose A. Salazar, Senior Project Manager at the Advanced Technology, Field Technologies Group for Southern California Edison, estimates that 80 percent to 85 percent of charges will occur at home. As a result, a substantial portion of the charging market will likely revolve around hardware sales. General Electric and the other giants hold a clear advantage in economies of scale. However, Read argues that the conglomerates will only dedicate a limited amount of bandwidth and attention to car charging, giving startups breathing room. Subscriptions and networks could further be helped, Read argues, by word of mouth and social networking. Consumers will talk about service, like they do with cell phone coverage. If Ecotality can gather positive buzz, it will further strengthen its position. Correction: I messed up the charger prices earlier.